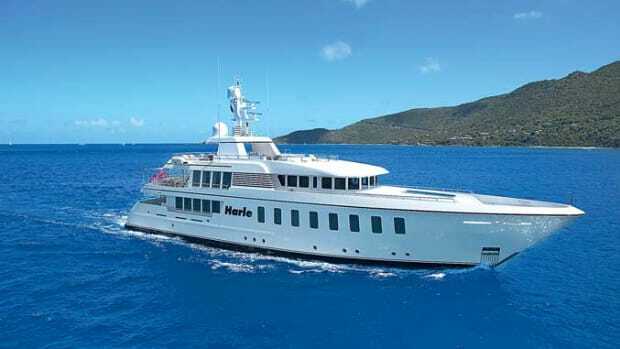 Few yachts have a provenance to equal that of Highlander, the steel-hulled Feadship superyacht that recently completed an extensive refit by her new owners, Joanne and Roberto de Guardiola, at Derecktor Shipyard in Florida. 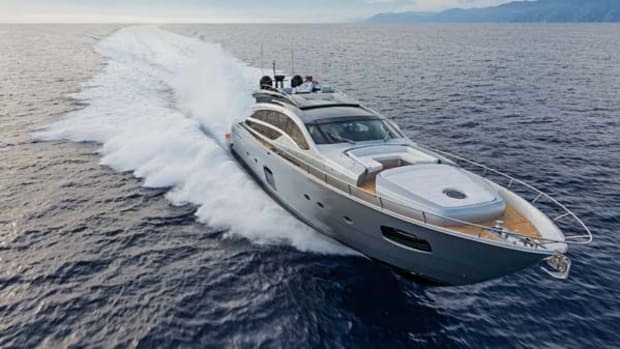 Delivered by the De Vries shipyard in 1986 with exterior and interior design by the late Jon Bannenberg, she was fifth in a series of vessels owned by media magnate Malcolm S. Forbes called The Highlander (the de Guardiolas have eliminated the article). Forbes—who died in 1990—and his family sailed the yacht to ports around the globe, including Communist China, entertaining political, corporate and celebrity guests in lavish style on board. This hospitality was so successful, they nicknamed the boat “The Ultimate Capitalist Tool” after a similar Forbes magazine tagline. The newly refit HIGHLANDER steams next to her fleet of tenders and toys, including Malcolm Forbes’ custom Cigarette, which also has been refurbished. De Guardiola, a graduate of Parsons School of Design who has had her own interior design firm since the late 1990s and is a member of the Architectural Digest AD100 designers’ list, is a boldface name in her own right. She and her husband made Page Six of the New York Post when they bought Highlander from Forbes’ heirs in 2012. 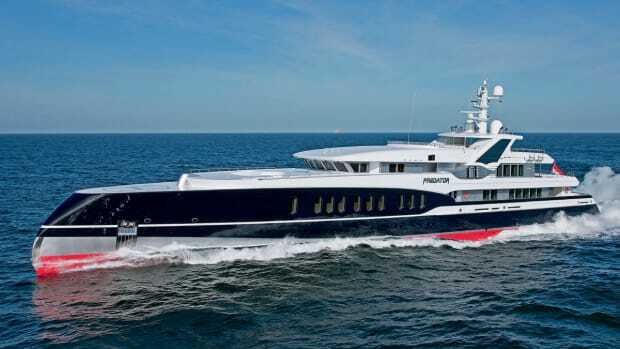 According to de Guardiola, Forbes hired Bannenberg to design The Highlander after he saw the designer’s 147-foot (44.8-meter) aluminum Feadship project Azteca, which launched in 1983. 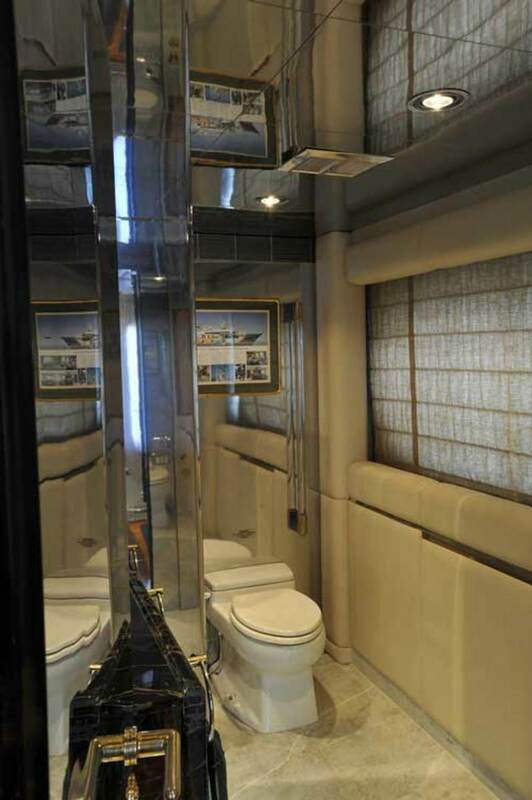 But, Forbes specified that his new yacht had to have a canoe stern like his previous vessels. AFTER: Elegant stonework is emphasized in HIGHLANDER’s newly updated guest heads. “You had Bannenberg’s very contemporary design married to Malcolm’s more conservative vision. Malcolm wanted his canoe back. I think it was the weakest part of the design,” de Guardiola said. 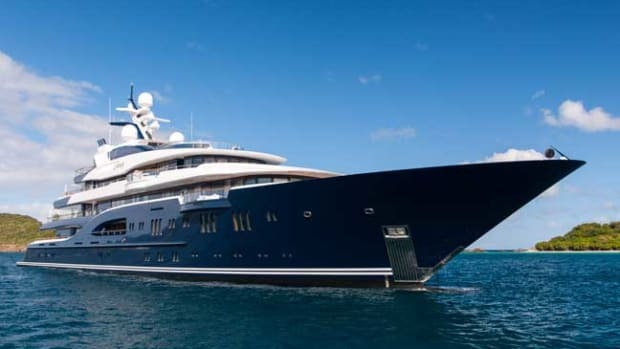 In addition, she felt that during the course of the 30 years or so that the yacht was in service, Bannenberg’s original design had been cluttered. “That will happen over time,” she said. 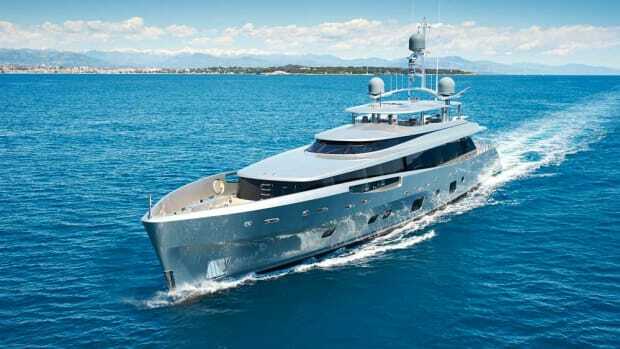 Highlander’s new exterior design, which de Guardiola drew with the help of naval architecture firm Murray & Associates, cut off the yacht’s old stern and extended it by 12 feet, bringing Highlander to her current length of just over 162 feet (49.4 meters). Instead of a rounded canoe stern, she now has a long, graduated stern that echoes Bannenberg’s lines for the rest of the yacht. De Guardiola also added brows to the forward superstructure on the main and bridge decks, extended the mast 7 feet into the air, realigned the top deck railing stanchions with the mullions of the famous glass “greenhouse” below them and lengthened the sundeck. De Guardiola drew HIGHLANDER’s new exterior design with the help of Murray & Associates. Among its features is an extended, reconfigured stern. 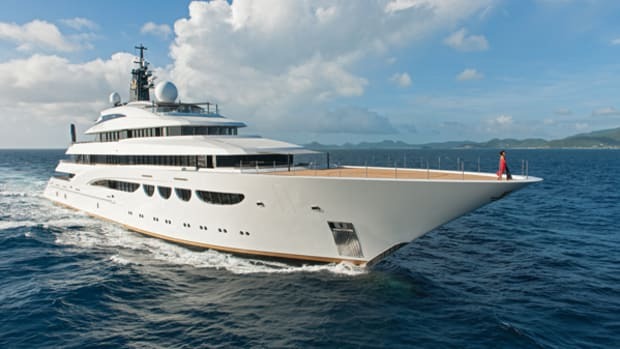 “The boat really retains that iconic Bannenberg profile. I think the owner improved it,” said James Brewer, director of sales and marketing of Derecktor Shipyards. Jack Schneider served as project manager at Derecktor Florida. When the work required the yacht to be hauled, Highlander became the first vessel to utilize the yard’s new 820-metric-ton mobile boat lift. In addition to the new stern, de Guardiola’s exterior design added “floating stairs” that run full-width across the yacht’s transom. 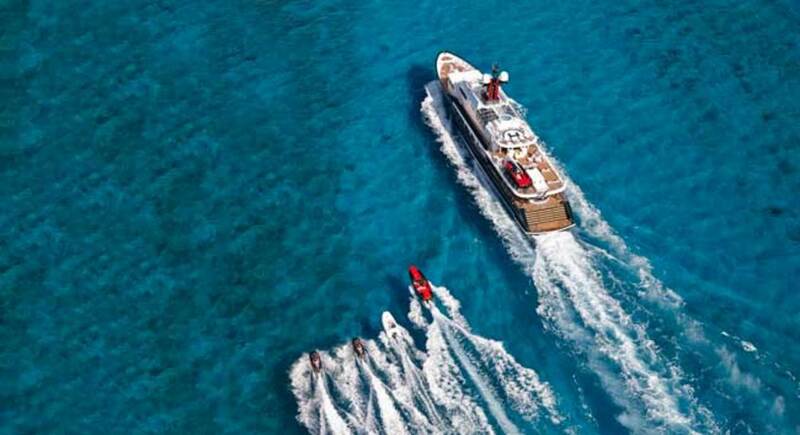 The yard also installed a 10-foot-wide Opacmare Transformer hydraulic water sports platform that can be lowered to create a large aft “beach” area—a must-have item for many of today’s yacht owners. “I wanted the access to the water. 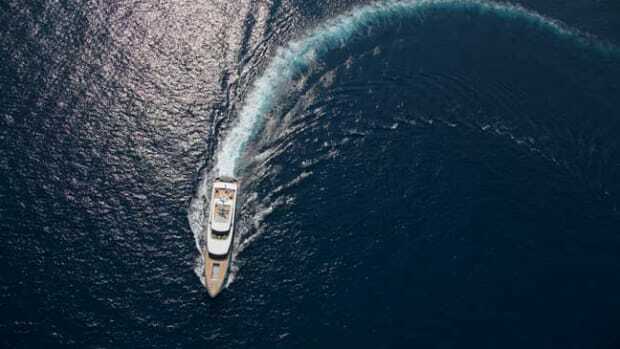 For myself, my family and friends, it is just a great part of yachting,” de Guardiola said. 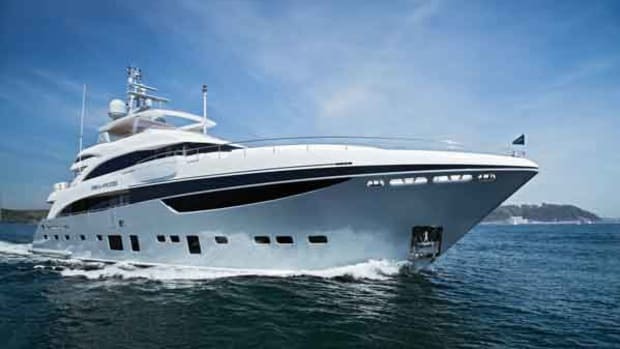 She also loves the way the Transformer can be raised into the air, opening access to the yacht’s tender garage and doubling as a high diving board. The new stern comprised a major part of Highlander’s refit, but it was by no means the only part of the 18-month project, which essentially gutted the yacht’s interior and started over. 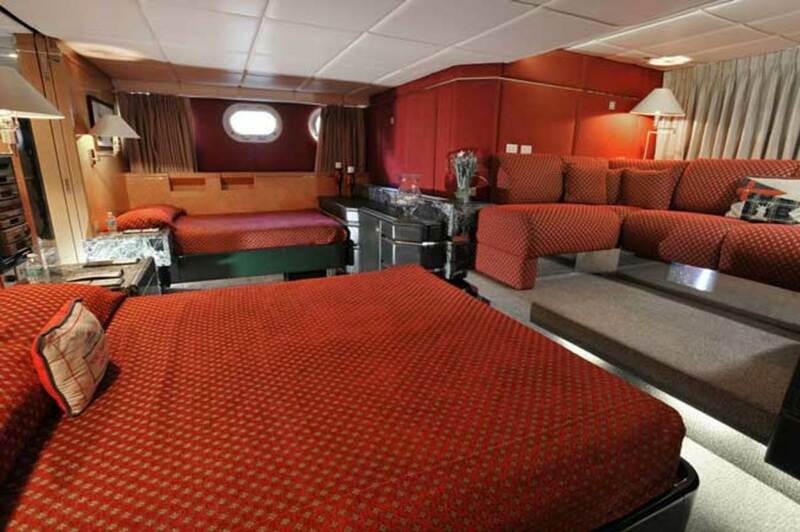 AFTER: The master suite, formerly located on the lower deck, is now on the main deck in place of the forward observation lounge. “Every technical aspect was updated. Every inch of wiring has been replaced,” she said. In addition, the engines and generators were rebuilt, and the black- and gray-water systems were upgraded. The navigation, communications and entertainment systems were modernized. The lighting throughout the boat was replaced by LEDs. Even the tender custom-made for Forbes by Cigarette Racing Team was refurbished. 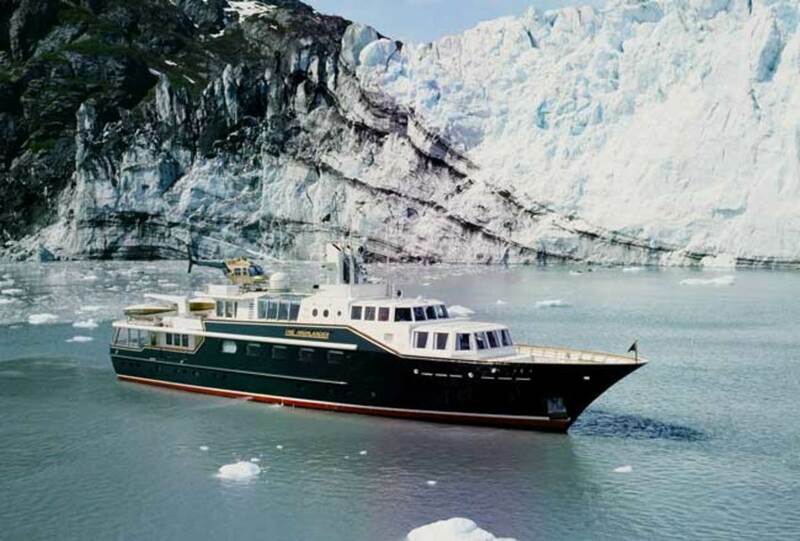 That was another major design challenge for the Highlander refit project—turning a boat that primarily had served as a party barge for entertaining VIPs into a family yacht and a luxury charter vessel. 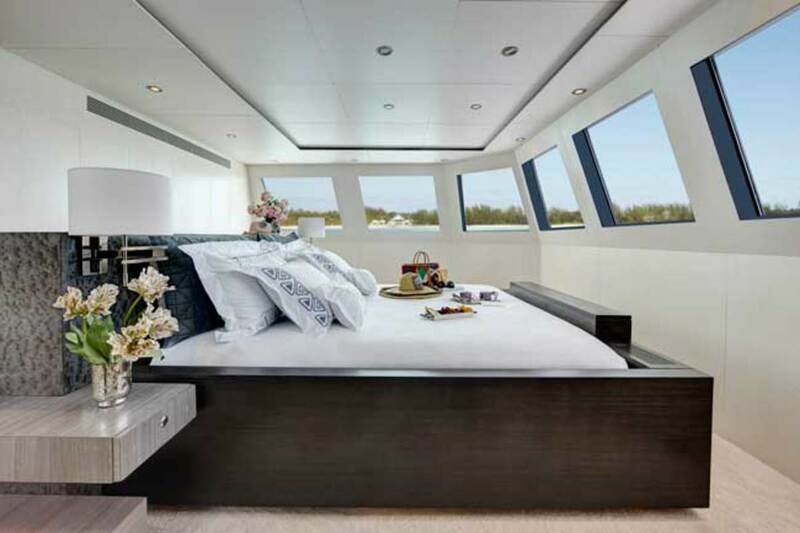 Her new interior design for Highlander optimizes the yacht’s interior volume. “A big goal in thinking out each room, each space, was to maximize your options,” she said. AFTER: Joanne de Guardiola replaced the main salon’s Highland plaid carpeting and built-in furniture with oak flooring and loose, contemporary furnishings. On the main deck aft, replacing the enclosed lounge that used to hold display cases with models of Forbes’ earlier yachts, is an open-air lounge with a contemporary dining “pod.” The front wall of the pod holds a bar; the rear wall is lower so it won’t block the view for diners seated inside. Opacmare built the triple glass doors that now lead from the afterdeck into the main salon. 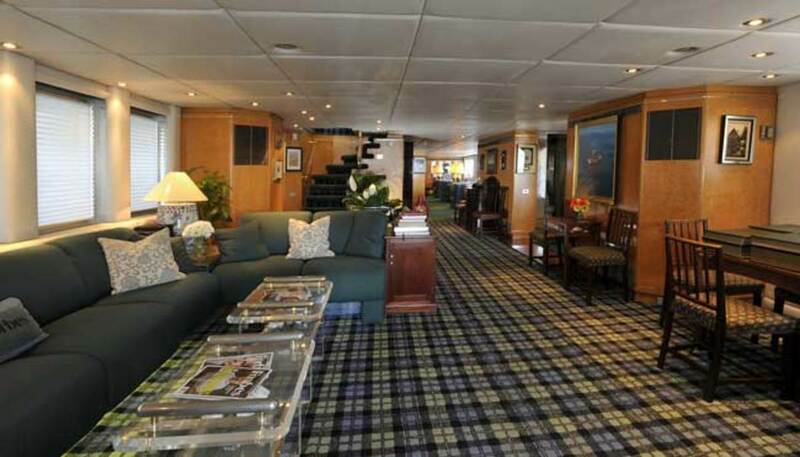 Here, the contrast is dramatic between the yacht’s former interior design with its plaid carpeting and clubby built-in furnishings, and de Guardiola’s new vision. Her interior is modern and minimalistic, incorporating colorful contemporary artwork set off by neutral backdrops and eclectic loose furniture. 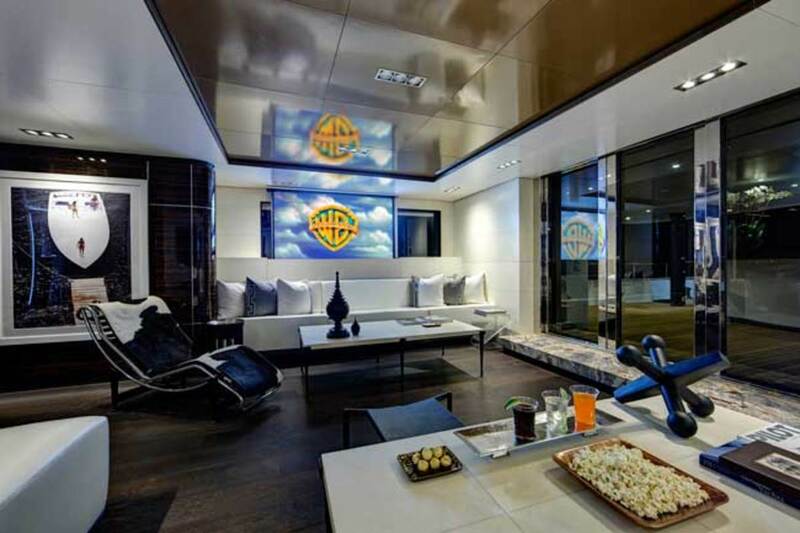 She opened up the main salon by eliminating the yacht’s formal, enclosed dining room, instead dividing the space into a media room with a 75-inch pop-up TV and an airy sitting area. By pulling out the padded headliner and adding a raised tray ceiling, she gained 4 inches of headroom. “Bannenberg liked low ceilings. I don’t like low ceilings,” de Guardiola said. The windows were re-boxed, the lighting was replaced with LED fixtures from Cantalupi USA and the floor was laid in wide oak planks sourced from UltraWood in Pompano Beach, Florida. The walls and bulkheads also were reconfigured, creating niches for the artwork. “I like to play the art off against each other,” she said. Forward, in the old observation lounge where notables once viewed the Statue of Liberty through 180 degrees of windows, is now an elegant on-deck master suite. 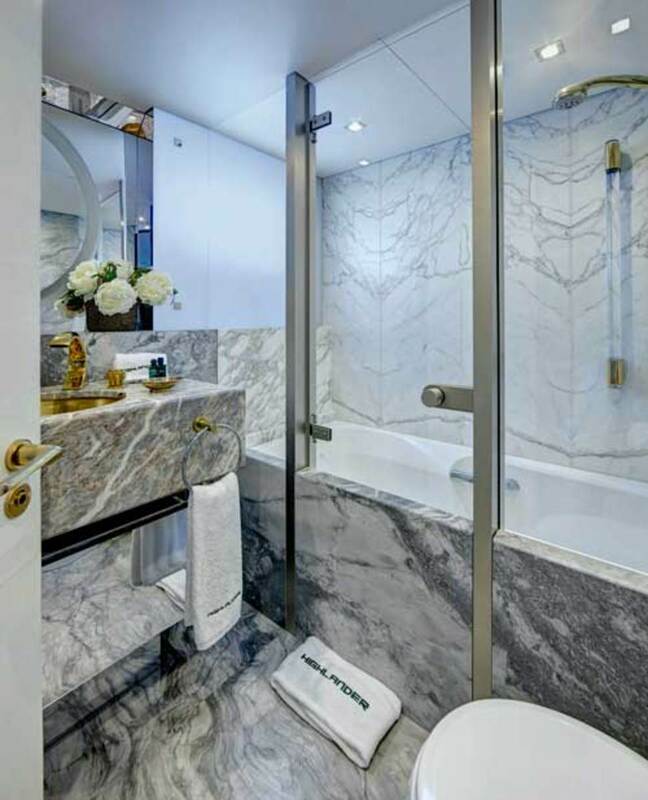 It incorporates a private office, a full-beam stateroom with a king berth that is raised for better sight lines through those windows and his-and-her heads. The new private office in the master suite. De Guardiola moved the galley up from the lower deck to the main deck pantry area, removing a wall to enlarge the space. “I confer with the chef all the time,” she said. “I didn’t want to be going downstairs to the galley—and the crew doesn’t want me down there.” She added a dumbwaiter, something else the crew is bound to appreciate. Moving the galley to the main deck also allowed for much more spacious crew quarters with a dedicated laundry area. The new lower-deck layout incorporates six guest suites including two queen-berth cabins, two with twins and a large VIP stateroom with Jacuzzi bathroom. The area formerly occupied by the steam room is now a massage room and another single cabin that can be used for a nanny or staff. The décor is clean, fresh and contemporary, with innovative touches like translucent white acrylic glass shades covering the portholes. “I don’t like portholes,” she said. She opened up the after part of the sky lounge and turned it into an open-air dining area with a stainless steel table that expands to seat 16. New swiveling windowpanes on either side can be opened to the breeze or closed to keep rain out. A built-in cabinet acts as a buffet and holds exercise equipment like free weights. Aft, Forbes’ 19-foot Cigarette and Donzi Classic 22, which both came along with the yacht, still make great eye candy on the tender deck. The refit retained the touch-and-go helipad but added a spa tub, cleverly created out of an old radome. 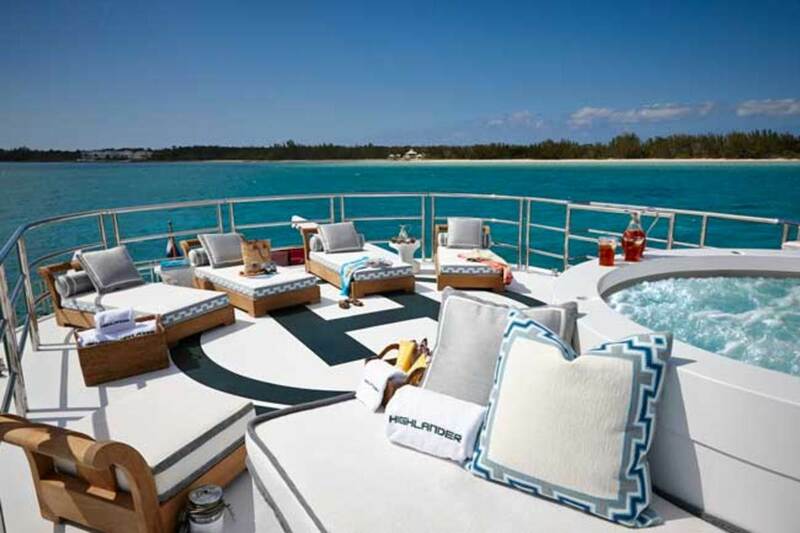 On the top deck, the de Guardiolas decided to keep the touch-and-go helipad that once welcomed heads of state. “They checked it; it was up to code,” she said. Forward, however, she had the refit team cut off the top of a huge old communications dome and install a Jacuzzi in its base. The hot tub incorporates a fountain and lights up at night with multicolored LEDs. A catwalk leads across the top of the “greenhouse” to a new open-air bar forward, where guests can feel in command of all they survey, much like Forbes’ celebrity guests once did. 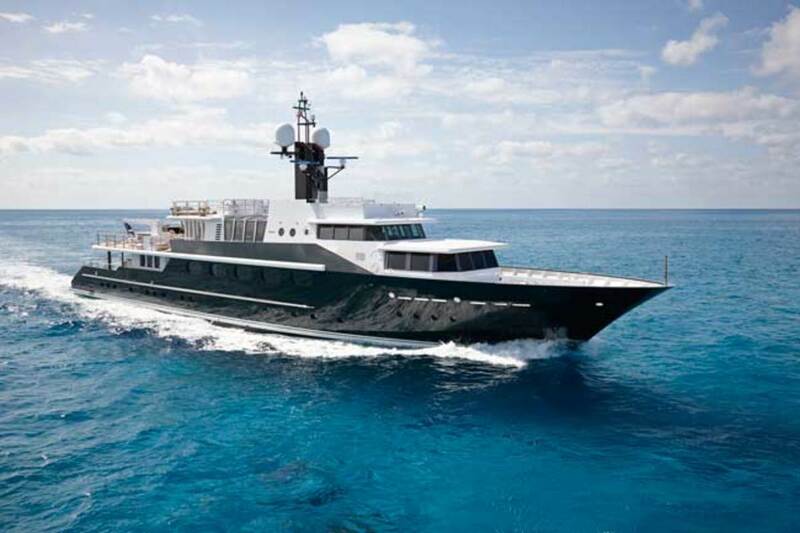 With Highlander’s refit, de Guardiola clearly has succeeded in preserving Forbes’ exuberant spirit of hospitality along with Bannenberg’s unique design vision—while at same time creating a yacht where family, guests and charter clients comfortably can enjoy the good life at sea. “We’re very proud of the job,” Brewer said. EXTERIOR STYLING: Joanne de Guardiola Design, Inc. INTERIOR DESIGN: Joanne de Guardiola Design, Inc.